Yes and No! There are many variables to be considered in placing the implant(s). First, the patient must be healthy. There must be adequate healing powers present in the patient. For example, if the patient is an uncontrolled diabetic, inconsistent healing could complicate the procedure. If such a condition develops at a later date after the implant(s) has been done, this too may complicate the future of the implant(s). Second, a proper diagnosis must be made, and the proper implant placement and procedure must be selected for the individual patient. Third, the implant(s) must be treated properly by the patient and the dentist. If either person is neglectful, there could be complications. Fourth, if the patient is a heavy smoker or an excessive alcoholic beverage consumer, the success of implant(s) will be affected. Very few things do last a lifetime. There are some implants which have been in the mouth for as long as thirty years. This is not the average. The average expectancy is less and varies based upon numerous variables, such as the patient’s health and proper maintenance. In the final analysis, whether they last a lifetime depends on how long you live and what age you are when implants(s) are placed. Every natural tooth in the mouth of every living person will have one of two possible fates: it will last until we die, or it will be removed at some time. The same thing applies to implant(s). No! Health is the determining factor. Many people seventy and eighty years of age are a better surgical risk than someone years younger who has physical complications. Older individuals are more likely to need implants because they have lost more teeth, and have lost more supporting ridges. As long as you live and breathe and are important to someone, including yourself, you owe it to them to take the best care of yourself that you possibly can. Incidentally, what is a good age for a hip replacement implant or a coronary bypass? If you needed either operation to stay alive or improve your quality of life, would you refuse because of age? Implants are made of biologically compatible materials which have undergone extensive testing over a period of several years. Since these materials are largely metals, such as titanium, and surgical vitallium alloy and have never been living tissue, there is no likelihood of causing an antigen-antibody response which could cause rejection similar to that which sometimes occurs with heart and kidney transplants. On occasion, bone processed from cadavers is used for bone augmentation or regeneration. These products have been used for more than 30 years in medicine, without one incidence of disease transmission. However, on rare occasions it may be rejected and fail to work. Are dental implants inserted for cosmetic reasons? Not usually. 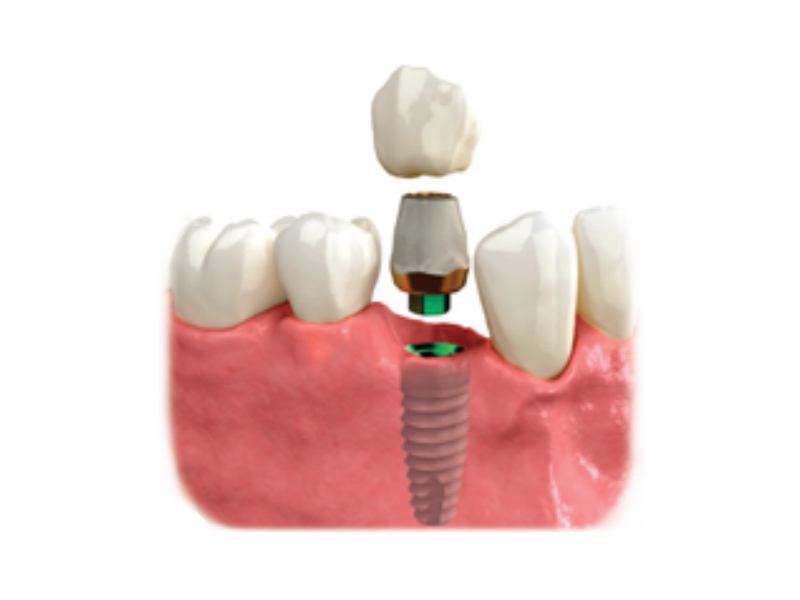 The primary objective of dental implants is to give additional support to the replacement teeth. Cosmetic enhancement is possible with the replacement teeth, however, and your expectations should be fully discussed prior to treatment. There is no way that we can guarantee anything which goes into the mouth and which is under the control of the individual patient. Physicians do not tell you that the transplanted heart, kidney or coronary bypass will keep you alive for any specified period of time. We can only tell you that we will strive to place the implant(s) properly and provide you with the information you need to help care for your continued dental commitment. If you do not keep your end of the bargain, the implant(s) will likely fail. Also, you must return to our office at regular intervals for examination and service according to our recommendations. If you do not do this, difficulties may arise, resulting in the loss of the implant(s). Under such circumstances, the fault would be yours. Due to the complex nature of oral implantology, it is important that all postoperative examinations and/or treatments be handled by this office. Referrals will be made only to those doctors with experience and training in implant dentistry. Implant procedures, which vary in complexity and extent depending on the patient’s dental condition and requirements, can involve a significant investment. A survey of 350 consecutive patients after completion of their implant treatment revealed that not only was it worth the investment, but that they would happily do it again. Some dental procedures, implant surgeries and/or portions of the implant surgeries, are covered by dental and medical insurance policies. Our office personnel will assist you in obtaining these benefits. Just as with any surgery, there can be some pain (discomfort). However, anesthetics and sedation virtually eliminate pain (discomfort) during the actual surgery. Postoperative pain (discomfort) will be similar to that of having teeth removed. Patients will be provided with medication to alleviate this pain (discomfort). How much time does it take? It depends on your condition and needs, and the extent of the work involved. Individual operations may take from one-half hour to several hours. There may be as few as one operation or a series of operations and follow-up visits, which would be scheduled over a period of months to insure proper healing. Generally, we recommend the day of the surgery, plus the following day or two off for recovery. You can expect to have some swelling, pain (discomfort) and possibly some bruising. The time taken off from work is really an individual decision. This is an important part of treatment. If you have uncontrolled medical diseases, they often affect the healing of implants and also relate to how long they will last. Please make sure to inform us of any diseases, medication and allergies. The dental care you provide yourself at home must be first-rate. You must keep your teeth and implants cleaner than you have ever done previously in your life. You must be able to use a toothbrush, dental floss or other devices we recommend to keep plaque off both your natural teeth and the implants. If this is not done, there is a very good possibility that the implants will not succeed, and will have to be removed. Furthermore, smoking and/or excessive alcohol consumption are a deterrent to excellent dental health. You will have a complete examination with x-rays which may include an i-CAT® CBCT of your entire mouth. X-rays are necessary for proper diagnosis during treatment and for follow-up after treatment is complete. The teeth, or denture, which are opposite to the implanted area are a very important consideration in the success of the implant(s). There must not be any grinding of the teeth at night (bruxism) against the implant(s). Care must be taken not to overload the implant(s) by chewing on hard objects such as ice, which could damage even your natural teeth. The patient should not engage in anything which may cause damage to the implant(s) or the underlying bone, such as full contact sports. There are cases reported in dental literature in which there is temporary loss of nerve sensation following certain surgical procedures. This does happen sometime, but is usually temporary. Motor nerves are never affected. Unfortunately, there have been instances where complete nerve sensation has not returned even after many years. There have been such occurrences following removal of deeply impacted wisdom teeth. It is possible that such a thing could happen with the placement of implants in bone. It is usually temporary, and is a loss of nerve sensation only, not causing a drooping or sagging of the face.